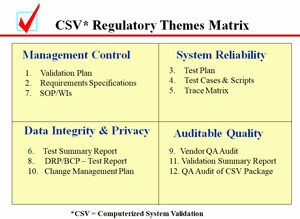 The four articles below provide free download of published articles by Dr. Stokes that describe a three package approach to Part 11/Annex 11 compliance for systems and software. -- click a link below to read, print and download a complete article. Part 1 describes the end user department’s Performance Qualification (PQ) package of validation evidence showing fitness for regulated work purposes (GCP, GLP,GMP = GXP). Part 2 discusses the IT department’s Installation Qualification (IQ) package of validation evidence to show fit to local platform and infrastructure. Part 3 defines the software developer’s Operational Qualification Package (OQ) of evidence to verify operation to requirements and design. 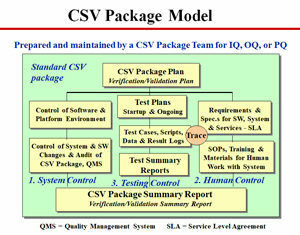 Part 4 presents the roles and activities for Quality Assurance (QA) and Quality Control (QC) in computer validation.